Investors are, today, asking tough questions of companies. The main reasons are related to risk management in the short term and to assessment of the real chances of growth in the medium and long terms. Stock markets have created, in recent years, several socially responsible stock market indexes. Analysts for these indexes are asking a broader range of questions of companies. As a consequence, shareholder resolutions are asking companies for better non-financial disclosure Tweet This!. Banks are also creating “ethical”, “social” or “responsible” funds to attract investors to invest in selected companies with particularly good performance in various aspects of the sustainability agenda: good governance, ethical values, social agenda, environmental actions, etc. In the general business context, through the Carbon Disclosure Project, hundreds of investors with trillions of dollars under management ask companies about their greenhouse gas emissions. 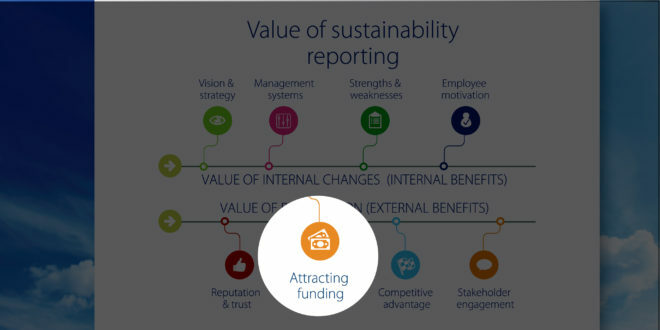 The implementation of a GRI reporting process has helped companies to better manage sustainability issues, to understand their main strengths and weaknesses, and to prepare to talk about their own sustainability performance in a concrete way. This is evidence of high-quality performance management, and attracts investors.